It is difficult to find black holes, because they are completely black. In some cases black holes cause effects which can be seen. For example if a black hole has a companion star, gas streaming into the black hole piles up around it and forms a disk. The disk heats up due to the enormous gravitational pull by the black hole and emits intense radiation. But if a black hole is floating alone in space, no emissions would be observable coming from it. A research team led by Masaya Yamada, a graduate student at Keio University, Japan, and Tomoharu Oka, a professor at Keio University, used the ASTE Telescope in Chile and the 45-m Radio Telescope at Nobeyama Radio Observatory, both operated by the National Astronomical Observatory of Japan, to observe molecular clouds around the supernova remnant W44, located 10,000 light-years away from us. Their primary goal was to examine how much energy was transferred from the supernova explosion to the surrounding molecular gas, but they happened to find signs of a hidden black hole at the edge of W44. During the survey, the team found a compact molecular cloud with enigmatic motion. This cloud, named the “Bullet,” has a speed of more than 100 km/s, which exceeds the speed of sound in interstellar space by more than two orders of magnitude. In addition, this cloud, with the size of two light-years, moves backward against the rotation of the Milky Way Galaxy. The team proposed two scenarios for the formation of the Bullet. In both cases, a dark and compact gravity source, possibly a black hole, has an important role. One scenario is the “explosion model” in which an expanding gas shell of the supernova remnant passes by a static black hole. 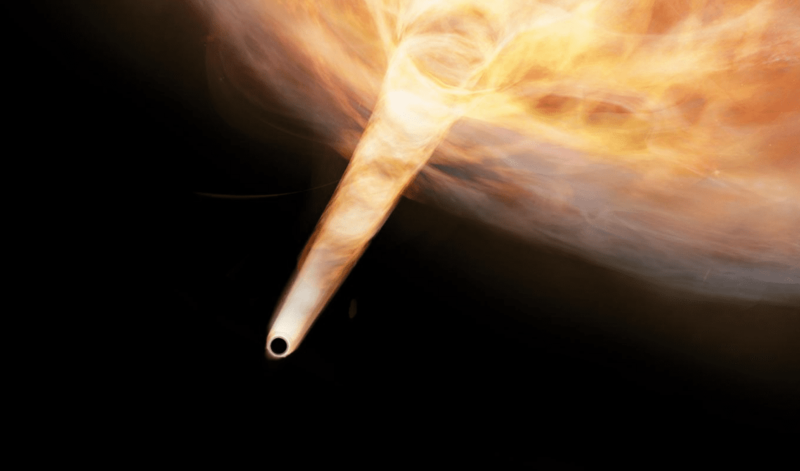 The black hole pulls the gas very close to it, giving rise to an explosion, which accelerates the gas toward us after the gas shell has passed the black hole. In this case, the astronomers estimated that the mass of the black hole would 3.5 times the solar mass or larger. The other scenario is the “irruption model” in which a high speed black hole storms through a dense gas and the gas is dragged along by the strong gravity of the black hole to form a gas stream. In this case, researchers estimated the mass of the black hole would be 36 times the solar mass or larger. With the present dataset, it is difficult for the team to distinguish which scenario is more likely. Theoretical studies have predicted that 100 million to 1 billion black holes should exist in the Milky Way, although only 60 or so have been identified through observations to date. “We found a new way of discovering stray black holes,” said Oka. The team expects to disentangle the two possible scenarios and find more solid evidence for a black hole in the Bullet with higher resolution observations using a radio interferometer, such as the Atacama Large Millimeter/submillimeter Array (ALMA).